Spokey Tornado scooter is designed for those looking for alternative means of transport, planning recreational scooter riding. We set high requirements for our equipment, therefore we make every effort to use the highest quality materials to manufacture the products. We know it is good to stand out and that is why we put special emphasis on the original and refined design. Our scooters are manufactured in line with state-of-the-art trends and in the most fashionable colour versions. Tornado model was manufactured 100% from aluminium, which makes it durable, at the same time keeping it very light. Big wheels (200 mm) and highest class bearings (ABE97 ZZ) ensure smoothness of movement and allow you to reach high speeds. The scooter is equipped with a foot brake enabling to adjust the riding speed to the existing conditions and a mudguard and toe enabling its comfortable "parking" at any place. Adjustment of the handlebar's column allows to adapt the scooter's height to the user's height. Folding option enables comfortable transport and storage of the scooter. Big anti-slip deck with a graphic allows to place your foot in a comfortable position. Recreational ride, riding in the city and in the park. Made of 100% aluminium material. Deck: 45 cm length by 17 cm width. 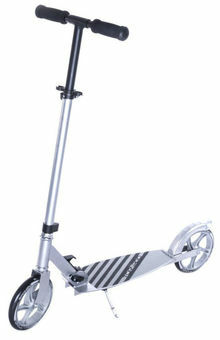 Additional Features: foldable, foot brake, soft handle, kickstand, non-slip, wide deck with graphic.